"Chamber into the X Dimension" is the 5th Mandrake Sunday story. The story was written by Lee Falk and drawn by Phil Davis. Mandrake and Lothar meet professor Theobold who has invented a way to project people into the "X" Dimension. He has already projected his daughter into the "X" Dimension, but now he is unable to bring her back. 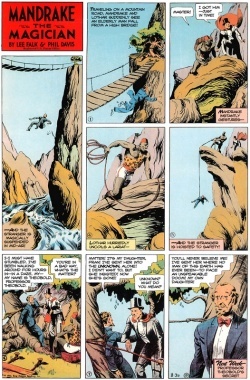 Mandrake and Lothar volunteer to be themselves projected into the "X" Dimension, in order to seek Fran. At the deepwoods.org index the title for this story is "Chamber into the X Dimension", which is lifted from the plot. Note: Mandrake using real magic in this story.